The upcoming implementation of FSMA will likely result in increased scrutiny of contaminants in food products. If the foreign matter can be identified, steps can be taken to eliminate the source of contamination and avoid future losses of product. Small foreign particles are sometimes observed in drums of bulk granular or powdered raw materials. While these foreign particles may be seen as dark specks in the product, they are often too small for standard QA/QC methods of analysis. Microanalytical techniques, however, can be used to isolate and identify the specks. This article describes a case study of dark particles in a granulated sugar sample. Ideally, when conducting contaminant analysis, all sample manipulations take place in a cleanroom to eliminate the chance for contamination by extraneous environmental debris. This is especially important when working with small contaminant particles, which may consist of environmental debris such as metal particles, fibers and other types of dirt. If the unknown particles are identified as common environmental debris, the analyst must be certain that he or she did not introduce any debris while handling the unknown sample. The first step in the identification process involves examination of the sample under a stereomicroscope. Figure 1 is a photomicrograph of dark brown particles, less than 1 mm in size, in the sugar sample. Particles of this size must be isolated from the bulk product prior to analysis in order to correctly identify them. Since all of the dark particles are visually similar, only a few representative particles need to be isolated. The contaminants can be isolated by removing a small glob of tacky adhesive (50 µm or smaller) from a piece of tape with the pointed tip of a fine tungsten needle. The adhesive-coated needle tip is gently touched to the surface of one of the dark particles, causing the particle to adhere to the needle, and the particle is transferred to a glass slide or other substrate for further examination. Figure 2 is a photomicrograph of three dark particles, isolated from the sugar granulation. 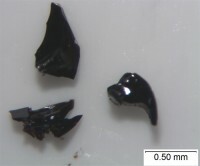 The dark brown particles have a smooth, shiny appearance with conchoidal (shell-shaped) fracture surfaces, and are visually consistent with glass. However, when probed with the tungsten needle, the particles are found to be brittle and fragile, and this texture is not consistent with glass. Therefore, chemical analysis is needed to identify the brown particles. 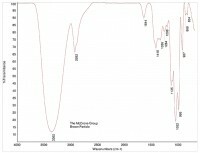 Most organic compounds (and some inorganic materials) can be identified by Fourier transform infrared (FTIR) spectroscopy. For the analysis of small particles, a microscope is coupled with a standard FTIR system; this method of analysis is known as micro-FTIR analysis. 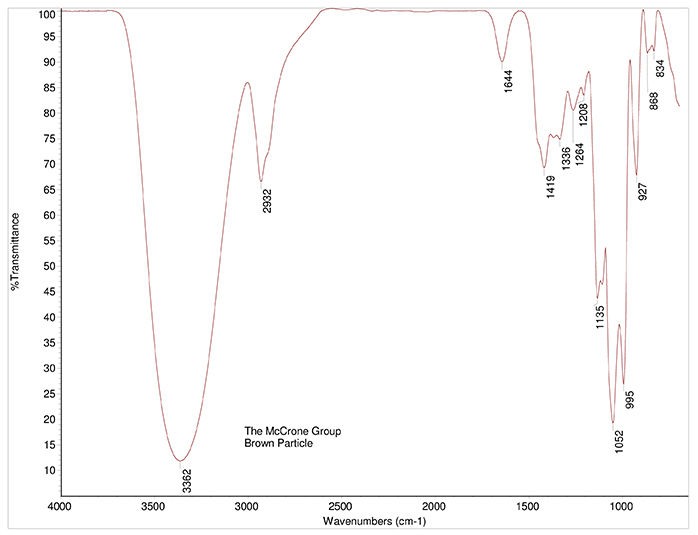 The micro-FTIR system passes a beam of infrared radiation through the sample and records the different frequencies at which the sample absorbs the light, producing a unique infrared spectrum, which is a chemical fingerprint of the material. By comparing the spectrum of the sample with spectra of known compounds from a reference library through an automated computer search, the sample can often be identified. In order for the FTIR analysis to work, the sample must be transparent, or thin enough to transmit light. In the case of the particles from this case study, this is achieved by applying pressure to a ~50 µm portion of the sample until it forms a thin transparent film. 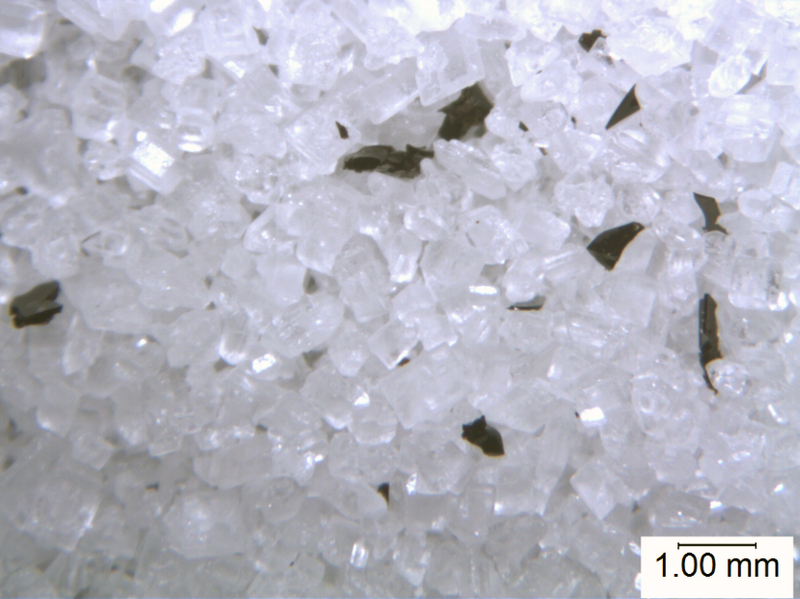 This film is placed on a salt crystal for micro-FTIR analysis. 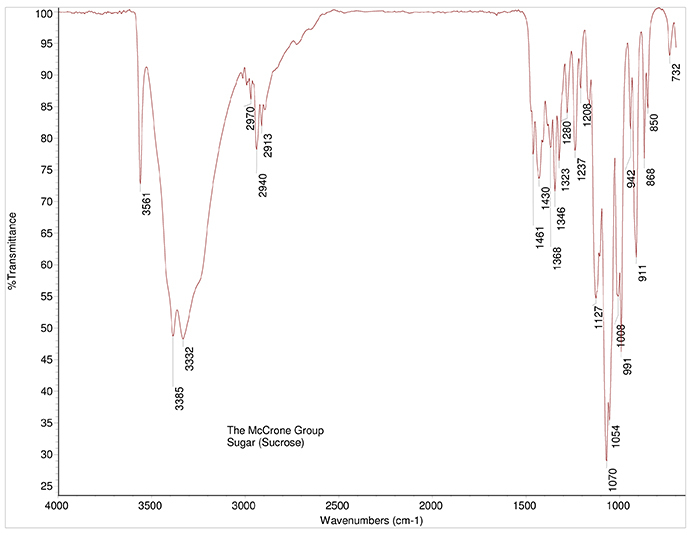 An FTIR spectrum of crystalline sugar is shown in Figure 3, and a spectrum of a brown particle is shown in Figure 4. 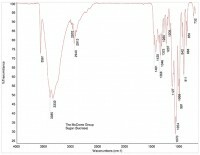 The spectrum of the brown particle has some similarities to sugar, but there are fewer peaks, and the remaining peaks are rounded, consistent with a loss of crystallinity. The loss of crystallinity, coupled with the brown color of the particles, suggests charred sugar. The FTIR method does not provide complete information about the presence or absence of inorganic materials in the contaminant. To complete the analysis of the brown particles, scanning electron microscopy (SEM) combined with an energy dispersive X-ray spectrometer (EDS) detector is needed. 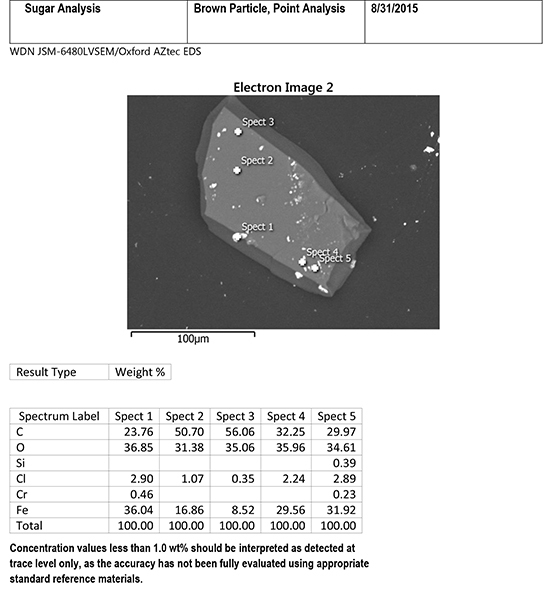 Using the SEM/EDS method, two types of information are obtained: SEM provides images of the sample, and the EDS identifies the elements that are present. A brown particle was mounted on a beryllium stub with a small amount of adhesive, and submitted for SEM/EDS analysis. 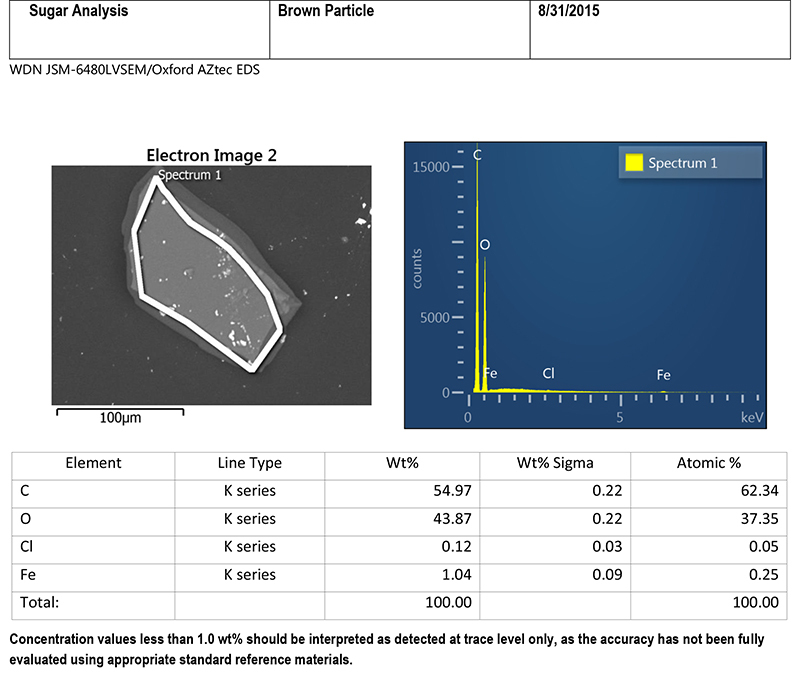 Figure 5 includes an SEM image of the particle, and a table of EDS data. The SEM image provides some information about the composition of the particle. This image was acquired using backscattered electron mode, in which heavier elements appear lighter in color. The image displays light colored specks scattered across the surface of the particle, indicating that more than one type of material is present. The light-colored circle on the SEM image shows the area that was included in the EDS analysis (the entire particle was analyzed). Looking at the column in the table for weight percent (Wt%), the particle consists primarily of carbon and oxygen, with small amounts of chlorine and iron. Carbon and oxygen are chemical constituents of sugar, but chlorine and iron are not. The EDS system can also be used to focus on individual small areas on the particle. Figure 6 includes EDS data from five specific light-colored specks on the surface of the brown particle. 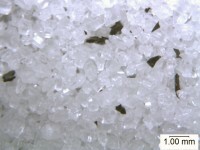 The specks contain major amounts of iron with small amounts of chlorine, and sometimes chromium and silicon, plus contributions from carbon and oxygen from the surrounding sugar matrix. The composition of the specks indicates steel corrosion, likely from low alloy steel. The presence of chlorine suggests that a chlorinated substance was the initiator for the corrosion process. In some cases, steel corrosion can be the sole cause of brown or dark discoloration of small particles. In the case of this brown particle, the SEM image shows that the iron-rich particles are not evenly distributed throughout the particle, but are only scattered on the surface. Charring is the most likely cause of the overall brown color of the particle. When examined under the microscope, the dark particles in the sugar sample had the visual appearance of glass. However, chemical microanalysis of the particles revealed that they were not glass at all, highlighting the importance of microanalytical methods in determining the identity of the foreign matter. The brown particles were ultimately identified as charred sugar particles with scattered specks of steel corrosion (likely from low alloy steel) on the surface. This information can be used to narrow down the search for possible sources of the brown particles in the bulk sugar sample. As part of a root cause investigation, samples of dark particles from various locations in the manufacturing and packaging processes can be studied by the same techniques to look for a match.